Wow! I haven’t posted an 11-11 reading update since March! But I have been reading from the list, gang, and I’ll be playing catch-up in my reviews every few weeks from now on. There’s certainly something to be said for learning to appreciate an older style of writing. I labored with Dostoyevsky for example; I even had to work at loving Chekhov. But such adjusting periods usually pay off because the literature is so rich and beautiful and, for the writer, informative about the possibilities in craft. 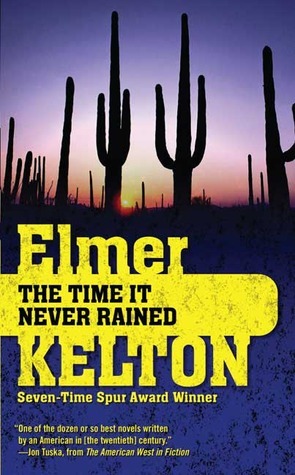 I’ve labored long and hard with Elmer Kelton’s The Time It Never Rained, because it is an historical novel rooted firmly in a particular culture, a particular era, a particular economy. It addresses issues of race and class, of politics, of environmentalism. It is a complex novel. But my problem with it is this: it takes too damned long to get itself underway, and the labor doesn’t really pay off. Sure, the characters that start out as stolidly stereotypical do eventually develop distinct personalities, individual motives, a life outside the plot. 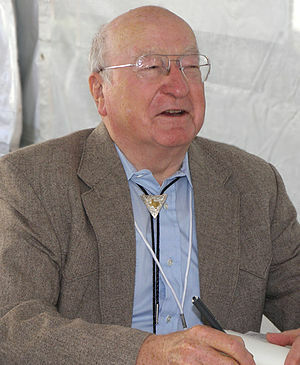 But before Kelton can let these characters live and breathe on their own, he feels the need to utilize them toward some other Purpose, with a capital P: namely, he needs to take the time to explain to us, in textbook detail, the harsh mechanics of ranch life, the prejudices of every class of character, and — most importantly — his conservative, anti-government political slant. And he takes forever doing it. I suppose that, given the beauty of the second half of the book, that wait might seem worth it. But here’s my problem: While Elmer Kelton takes somewhere between 120 and 150 pages to set up the socio-economic realities of his novel, Jane Austen managed the same in the very first sentence of Pride and Prejudice. And I think if Kelton had sacrificed his research and his memoirs in favor of tightly crafted storytelling the way Austen did, this would have been a much, much finer novel. So I think it would be foolish to ignore the political message wedged into practically every page of this novel, and because the story and the characters become so servile to that message, it’s hard to take this book seriously as a work of fiction. I should say, though, that the problems with story aside, it’s clear that Kelton is a damn fine writer; and in the end, despite Flagg’s “heroic” efforts to resist government aid, the novel ends on a note as bleak and unforgiving as any I’ve seen, which is just the way I like my endings. So I would welcome a chance to read one of his less personal, less politically motived historical Westerns. Don’t know how you can enjoy reading a book when you labor at tearing it apart. I read the rich lore of local history, local politics and other aspects of West Texas which includes the conservative, political mindset of its people. The author is describing the politics of the region, like it or not, yet I don’t read it as if he is promoting that over the reader’s preferences. That’s a good question, Dad! Seriously. The way I look at any novel is this: Some people like to read a good mystery novel in part because they enjoy teasing out the mystery, they like puzzling out for themselves “who done it” by the end of the book. Most writers, like me, enjoy reading ANY novel in part because we like to tease out the craft in the book, we like to puzzle out for ourselves not the “who done it” but the “how done it” — how did the author manage what he or she managed. We like that process, even when we wind up not liking the book. I know this didn’t come across in my review as well as the craft comments about the novel (and that’s because, to my eye, they were overshadowed in many places of the novel by Kelton’s craft), but I, too, loved the local history, local politics, and just general local color Kelton worked into that novel. When he got out of the way of himself and let these characters and these situations speak for themselves, the writing was terrific. My main beef (or mutton?) is that he too often got in his own way and forced certain situations or attitudes into the book. And, for this reader and this writer, that was a problem.